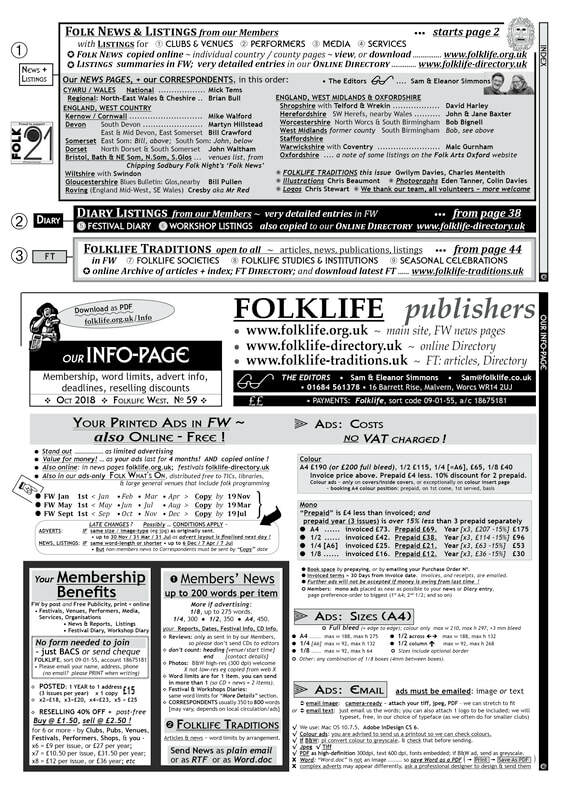 ​Folklife - print & online publishers. We print FW, the Folklife West magazine, and publish this & other material online. 52-56 A4 print pages published 3 times a year (4-monthly) from Jan 2019: 1 Jan, 1 May, 1 Sept.
FW's Folk News pages are copied to this site. News and listings - only from Folklife members. We also print 'Folklife Traditions' articles. Publicity bargain: our Membership is only £15 a year UK, for posted magazine and printing your news & listings and copying the news & listings online! What we do is first print & distribute the magazine for 1 Jan/May/Sept. Then we update online. The current issue of the entire magazine is online ! free ! but it's big (c.52 A4 pages) so it's split over 3 websites - the majority (say 40 of the 52 pages) on this main site has our members' news and summary listings. NEWS pages by area / county -- we copy FW print pages online [jpegs] on this website's FOLK-NEWS pages, and you can download them [PDFs], Also we include each area's local festivals. The latest Updates to our DIRECTORY, sent to Folklife Members who have opted in, occasional - about 8 a year. Folk 21 news in FW. ​We work with the Living Tradition magazine. 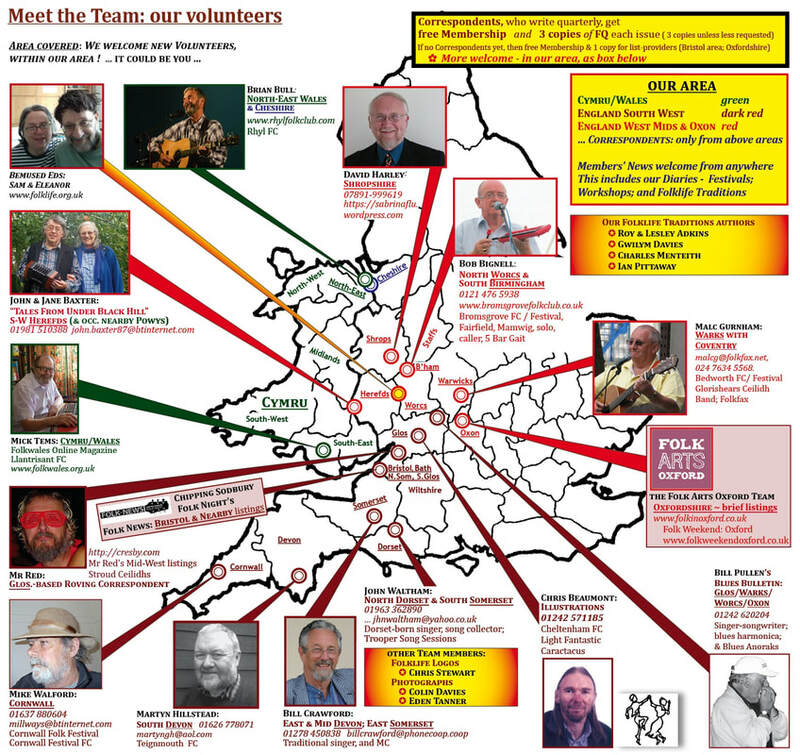 We print our Members' Folk News. As for reviews, see LT.
For reviews, which we don't have time to do (so don't send us CDs, please! ), see the reviews page of Folklife Member THE LIVING TRADITION magazine, www.livingtradition.co.uk . LT reviews online on ​www.livingtradition.co.uk/magazine/reviews as well as printed in LT.
Folklife Members can publicise their CD in FW, up to 200 words** + CD cover jpg. Where to buy Folklife West. We publish a vast amount of information! ● we are a non-profit group ~ FW runs at a healthy loss. Note: these webpages are copies of FW's A4-sizes pages -- too big for mobiles. So we also have PDFs to download ! You will be amazed at how much we have on this Directory site! 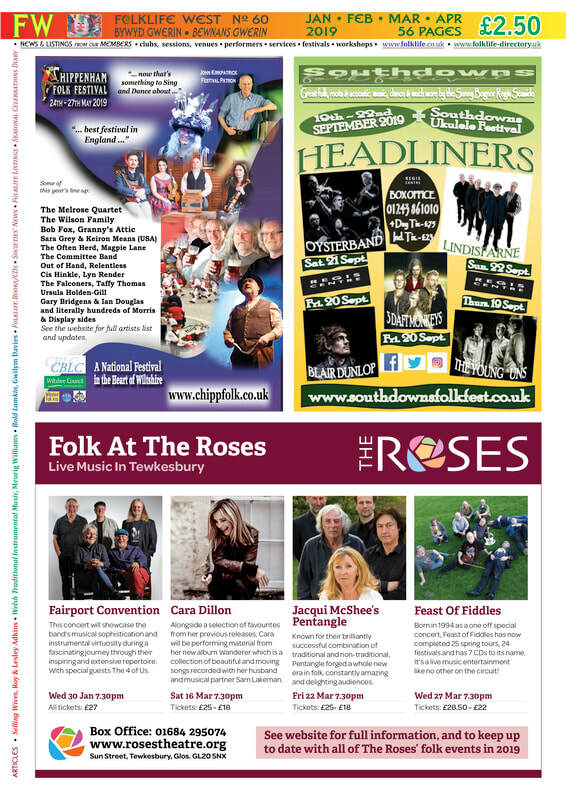 ​​For the benefit of advertisers, and the public, we also supply an ads-only version of FW, "Folk What's On', (4 to 10 pages), to libraries in regular-advertising areas, as a reference copy, & large concert-venues as free leaflets. Webpage includes free FWOn download ! FW runs at a healthy loss. The English Folk Dance & Song Society has announced that Every donation you make between now and 2019 is matched by Arts Council England. We have no such outside funding, nor any sponsorship. Our income is from your Folklife membership and limited advertising - since we focus on your news, & don't review CDs & avoid featuring folk personalities on the cover, we will not attract commercial adverts from record companies etc! We run at a healthy loss (say £1,000 a year) .... fRoots magazine was asking to be crowd funded for £20,000 ... well, we don't need quite that much, but if you would like to support us by taking out membership for 1 copy (£15 a year) or multiple copies for resale, and/or advertising, that will help us to carry on the good work!